A young Belgian man critically wounded in a shooting at the Jewish Museum in Brussels last month has died in hospital, becoming the fourth fatality. The Belgian, in his early 20s, was hit when a lone gunman opened fire on 24 May. The victim was a museum employee. A Frenchman suspected of the attack - Mehdi Nemmouche, 29 - is in custody in France. Prosecutors say he admitted the killings in a video. 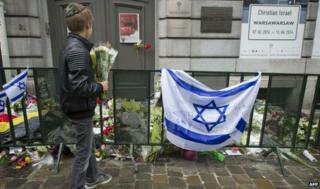 Security is being tightened now at Jewish monuments in Amsterdam. The Dutch city's mayor Eberhard van der Laan said the extra measures - which he did not specify - were a response to the Brussels attack. Amsterdam's Anne Frank House Museum and the Jewish Historical Museum already have metal detectors and bullet-resistant glass. Three people were killed outright in Brussels when the gunman opened fire - an Israeli couple in their 50s, and a French female volunteer. Mehdi Nemmouche spent more than a year in Syria and had links with radical Islamists, French prosecutors say. Police found him in possession of a Kalashnikov rifle and a handgun believed to have been used in the attack.